The Bidvine for Professionals Android App is a great alternative for Android-based smart phone users to grow their business on Bidvine. 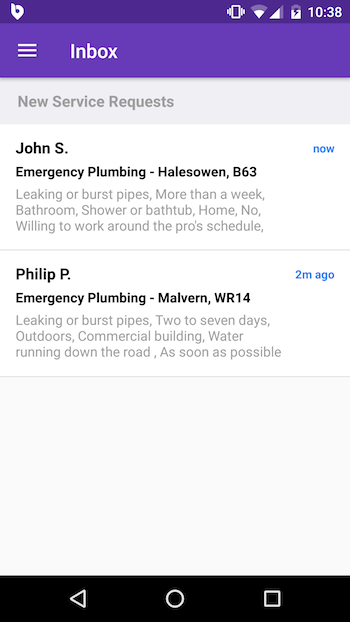 By installing our app, professionals will be able to manage leads and send bids without having to open up your browser. In addition, you can be the first to be notified when a new lead comes in, helping you to bid faster! Please note: If you are new to Bidvine, you will need to first create a professional profile on Bidvine.com and have a complete profile. When you first open the app, you will be asked for your email address and password to login. Upon logging in, you will be able to view your inbox. 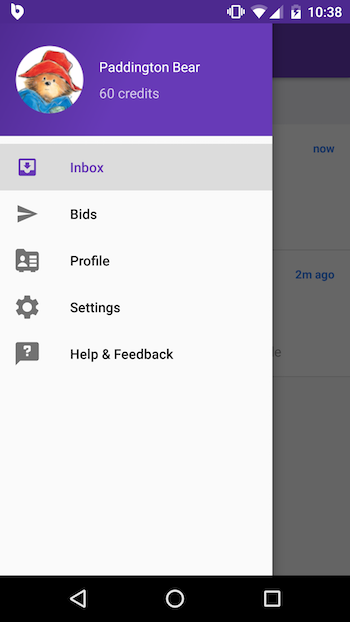 Inbox - here you see all active leads that you can review, bid, or pass on. You can also view any new messages sent by leads or customers from projects you've already bid on. To refresh the list, put your finger on the screen and slide it down (this similar to refreshing any other page in Android). By clicking the navigation icon (top left hand corner), you will be able to open the main navigation options for the app. Bids - here you see all the bids you sent and the customers who "hired" you. You can toggle between bids you've sent and customers who've hired you via the buttons at the top of the screen. You can also view any requests that you've previously archived. Profile - this will link to your public Bidvine profile. It will open in your preferred browser and let you see what information customers can see when reviewing your bids. Settings - this section will enable you to access and edit specific settings and link you to Bidvine.com to view/modify settings not currently editable on the app. Details on functionality not currently available on the app is detailed below. 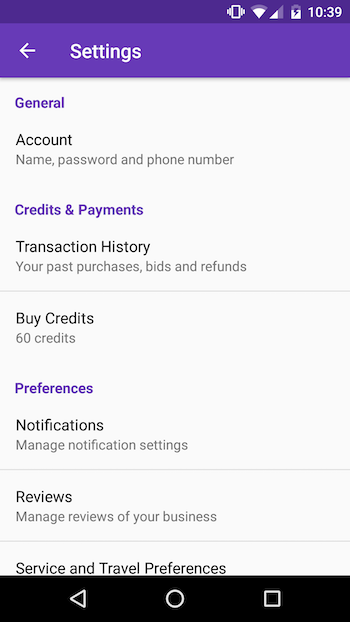 Under Credits & Payments, you can view your transaction history or buy credits. Please note, credits are 30% more expensive. This is due to the markups charged by Google. To get the best prices on credits, purchase them directly on Bidvine.com. In addition, we recommend you enable auto top-up after your first purchase so that when you run out of credits, the system automatically re-purchases your bundle of choice. 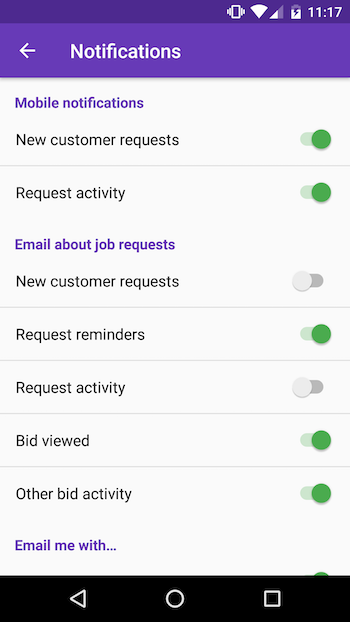 Notification settings, available via the settings screen, enables you to modify how you'd like to be notified about new leads, messages, and more. Pro tip: If you have mobile notifications turned on for new requests, you may want it off for email to reduce your inbox clutter. Account settings, available via the settings screen or by clicking your name/photo on the main navigation, enables you to modify your name, email address, phone number, and profile photo. 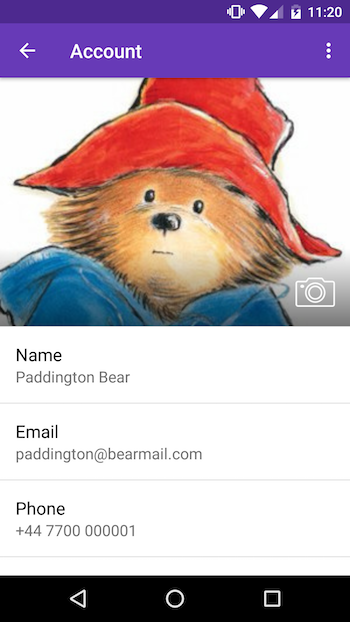 For your profile photo, you can upload a photo from your phone, or simply take a picture. (When prompted, please "allow" the app to access your devices media and access to your camera). While we are always working on improving our applications, there are currently a number of functions that you can only perform on our website. Edit your company profile but you can edit your name, contact number and email address under account settings.